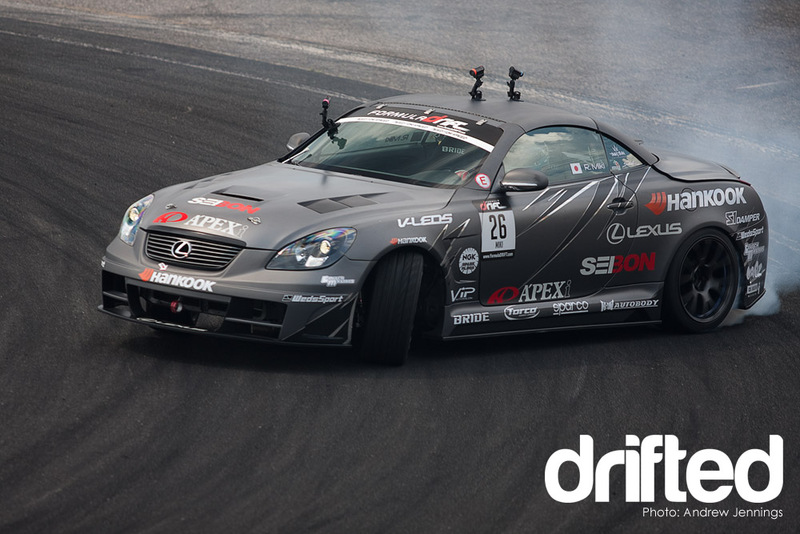 A’PEXi and Hankook tires rolled out Ryuji Miki’s brand new drift machine at Wall Speedway earlier this month for Round 3 of the 2010 Formula Drift championship. After competing for three seasons in a classic Mazda RX-7 FD3S, (check out my recap for more) it was time for a change. And what a change it is: say hello to his new Lexus SC430. I caught up with the driver and crew to discuss the build, and get their reaction to running it on the small oval course. Hit the jump to find out what I learned. In order to build a race car, drift or otherwise, a good first step would be the body. Dropping weight and letting more air into the engine bay will immediately aid the car’s straight-line performance. The guys over at Seibon were happy to oblige. They have crafted this one-off kit, especially striking on the hood and front fascia, which flows well with the matt grey paint color. Matt colors are a trend that is here to stay, and they look really badass. In stock form, the Lexus SC430 comes with a retractable hard top. Normally, that top is removed in a race car to save mass. Chris Forsberg runs without a roof over his head, as does Tyler McQuarrie and Darren McNamara. Rhys Millen on the other hand did exceptionally well running a top on his 2007 to 2008 Pontiac Solstice GXP though. How to choose then… screw it, just do both! At the touch of a button, the team can choose to put the motorized hard top up, or down. During practice at Wall, they ran it with the top up. Then for the main event, it was time to make like a drunk girl at Mardi Gras and show more of what was underneath. When the top is up, it reduces drag over the cabin. Down, it lowers the center of gravity to balance the weight out. Personally, I found it cooler when he ran the top down. Only time will tell which one Miki likes best as they iron out the rest of the details. The roll cage sits right at the top of the windshield, just barely fitting in the tight cockpit where wood and leather once covered doors and consoles. Although the hard top was salvaged, the rest of the amenities had to go. A pair of Bride Zeta III’s were installed to keep Miki and anyone lucky enough to ride shotgun firmly in place. Check out the position of the extended e-brake versus the shifter also. The white knob is the drift brake, while the black one down low is for the gears. Almost a reversal of placement, but like a WRC rally car, when you need to cut the rear tires loose it’s better to have that release close by. I just hope he doesn’t lose sight of it in all the smoke that is sure to fill the cabin! 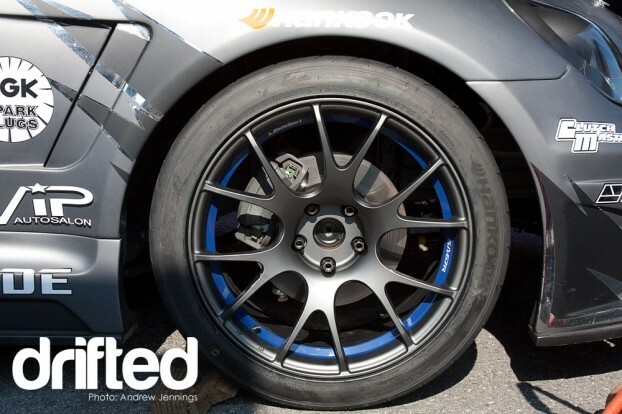 Hankook’s rubber has been wrapped around Weds Sport’s newest lightweight wheel, the SA-67R. The six split-spoke design comes in a matt-gunmetallic finish, matching the car’s paint nicely. In true Weds Sport fashion it also has a blue inner lip. Wall was not a night race, but V-LEDs have been placed strategically around the car to light things up when the sun goes down. D1 cars have been using this type of strobe setup for years, and I’m glad to see it finally making an appearance on more cars in the US. Looking back at the interior, I asked Miki what he thought of the steering wheel being on the left hand side of the car. 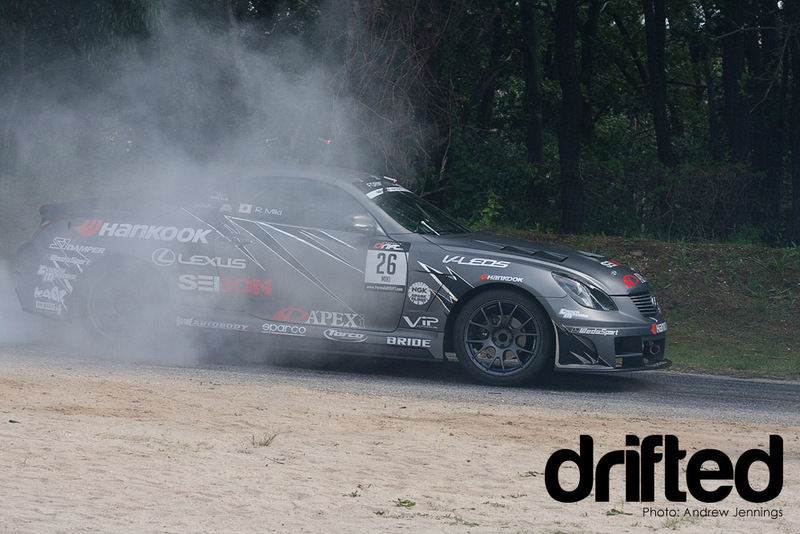 Recall that he struggled a little bit with this transition when he first entered the Formula Drift series in 2007. He smiled and shook his head to me in his usual relaxed manner, stating that now he was accustomed to sitting on either side of the car. When I probed further, it turns out that the current setup’s steering rack is actually too heavy for his current taste. This surprised me a little bit, considering how I’ve always found Lexus cars to have a very numb and loose steering feel. I guess when you’ve trying to compensate for oversteer at 60+ mph, the concept of “heavy” takes on a different meaning. For Miki, the easier it is to flick it from full lock to full lock, the better. Because the hard top was kept, the clam shell trunk lid is probably not structurally rigid enough to support the force of a large wing. I also asked Miki about the lack of downforce on the car, and how that was playing out over the weekend. He explained that at Wall, the speeds were small enough that you didn’t really need downforce to stay planted. As the team continues to refine the car later in the season, other tracks like Las Vegas may play a bigger role in the aerodynamic package. For the time being, it was more a question of power. On that note, I spoke to the chief mechanic responsible for the build, Chuck Griffice (aka “Chuck-san” as Miki affectionately called him). Chuck explained that in all of the prep work they had been doing to get the car ready for NJ, the motor was left virtually untouched. A new airbox and exhaust were about all that has been altered so far, and that may have gotten the car up to 300hp, but nothing exotic. There is a lot of potential still to be tapped from this motor, and with A’PEXi’s knowledge of turbo tuning I know they will get it right. For the time being though, I joked with Chuck that it didn’t sound “JDM enough.” He agreed, noting that the V8 has more of a muscle-car snarl than a raspy overseas bite. At Wall, Miki qualified 27th out of 32. 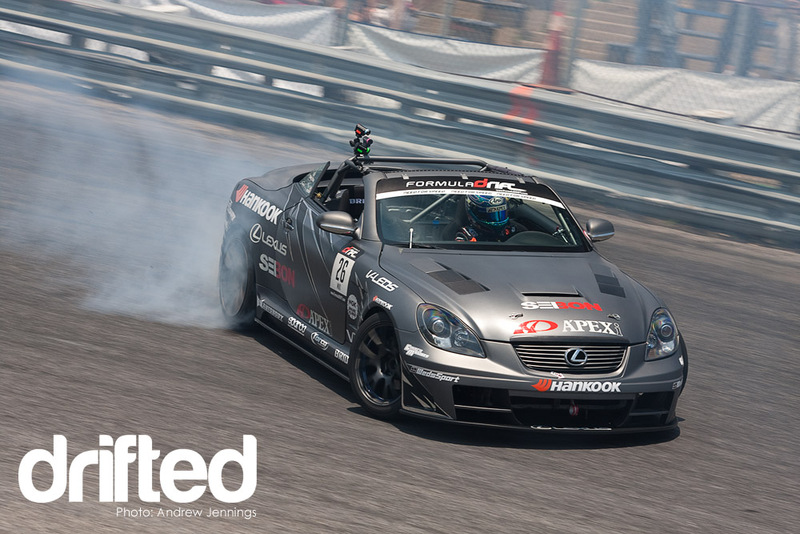 This paired him up with Ross Petty in the first round, and showed the weakness of having an underpowered car. In a tandem battle, not being able to keep pace with the lead car is a serious flaw. He was unable to advance to the top 16, but this is only the beginning of what could be a big chapter for the former D1 champ. Miki isn’t stressed though. His name in Japanese translates to “Three Trees,” and definitely fits his calm attitude towards racing and life. 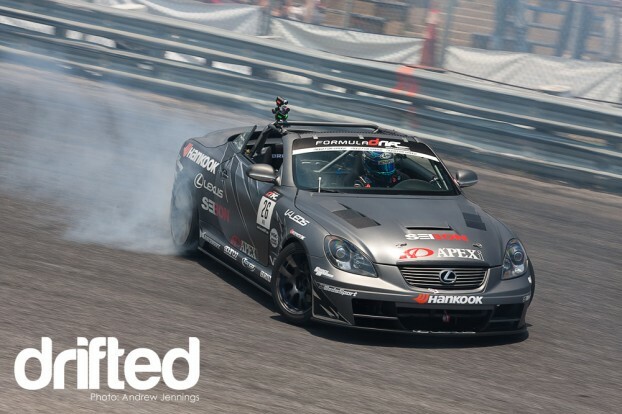 Look for his Hankook/A’PEXi Lexus to appear at future Formula Drift events, and show him some love in the comments!